Star Wars: The Force Awakens is a 2015 American epic space opera film directed, co-produced, and co-written by J. J. Abrams. It is the seventh installment in the Star Wars film series. It is topbilled by Harrison Ford, Mark Hamill, Carrie Fisher, Adam Driver, Daisy Ridley, John Boyega, Oscar Isaac, Lupita Nyong'o, Andy Serkis, Domhnall Gleeson, Anthony Daniels, Peter Mayhew, and Max von Sydow. The film broke U.S. box office records on its opening night, with $57 million made. Two sequels are scheduled for release in 2017 and 2019 respectively. Star Wars: The Force Awakens is available in 2D, 3D, and IMAX 3D. The story goes like this: Galactic Empire defeated thirty years ago. But, the Galaxy is now facing a new threat, a new faction named the First Order. Their main mission is to rule the Galaxy and destroy all who oppose them. Their commander is a ruthless, mysterious, powerful dark knight, Kylo Ren. Kylo has an ambition to find and kill the last Jedi which believed can bring peace and justice to the galaxy, Luke Skywalker, who has vanished. Luke's location is also a main concern for General Leia Organa, a General from the Resistance that now trying to find him too. Along with the progress, Han Solo and Chewbacca met some new companions: Finn - a former First Order Stormtrooper, and Rey - a scavenger from Jakku planet that found Poe Dameron's (one of the best Resistance pilot) BB-8 rolling droid. This unexpected association forced not only to fight and resist against the First Order, but also to find the key lines of Luke's location. But their main problem is, the First Order and their army of Stormtroopers will never let the Resistance's progress improves one step further ahead than theirs. 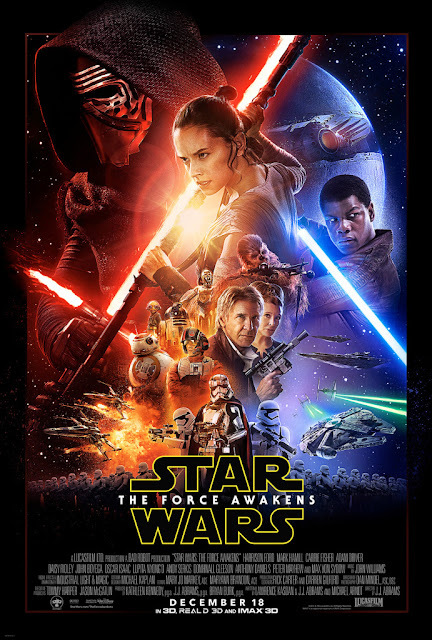 Star Wars: The Force Awakens is of action, adventure, sci-fi, and fantasy genre, which runs for approximately 135 minutes. It's rated PG-13 in most countries for sci-fi action violence. It is my first time to watch a Star Wars movie. Obviously, I wasn't a fan of the film series and I didn't really have high expectations from this film. But after seeing it, I can say that I'm starting to become a fan. I'm impressed by acting prowess of Harrison Ford, Daisy Ridley, and Carrie Fisher. I also happen to like BB-8 and Chewie - such adorable characters. While its plot was typical for a sci-fi movie, the flow of the scenes and transitioning were smooth, no dragging moments. Great use of CGI and special effects as well. There's really nothing bad I can say about the film. In my humble opinion, it could easily be among the best films of 2015.